Some common problems that can be present in babies when they are subluxated include: poor nursing, colicky, not sleeping well, chronic ear infection, not being able to turn head to one side, and many others. If you have any questions about whether chiropractic can help you or your child give us a call or send us an email. Subluxations can be present from the day we are born from the birthing process itself. Even though giving birth is natural it is still a traumatic experience for the babies thus it may cause underlying subluxation. This is just one of the many reasons why we recommend getting kids of all ages checked out. If you are not sure what chiropractic is all about or why you should get regular checkups check out our What is Chiropractic? page. We love to treat kids in our office. One of our main goals is to provide better health to as many families as possible. Part of giving families better health is treating kids. Dr. Craig Mortensen has 2 of his own children who were both born at home naturally using a midwife. As soon as his kids were born Dr. Craig was there to check their spines and necks and make sure that was everything was healthy and there were no subluxations present that may cause problems later in life. Some of the best things about choosing our office for your chiropractic and alternative health care needs is that we normally don’t charge for treating kids and infants as long as we are treating the parents of the kids. It’s just an extra service that we provide free of charge because the benefits are so great and all children are so precious that we want to provide them with the best, no matter what! Many people who come into a chiropractor’s office for the first time as adults would have had far greater potential for regaining their health if they had received regular chiropractic care as children. Adjusting a child is not a difficult procedure. 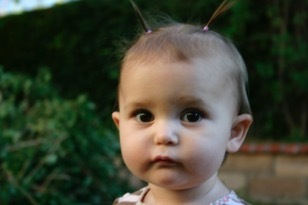 In fact, in most cases, a child’s spine is much easier to adjust than an adult’s. They have not had the long-standing subluxations, their muscles are usually not as tense and they are usually more relaxed in general than adults. Not only are kids easier to adjust, but also in most cases, they hold their adjustments for longer periods of time and their corrective adjustment plans are almost always significantly shorter than the average adult. However, with the falls, accidents and the generally active lives most kids experience, regular check-ups are vital. 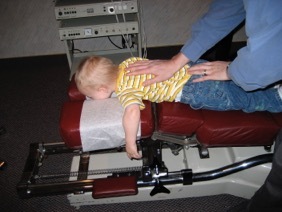 At first children are a little reluctant to get adjusted (as is anyone who has never been adjusted), but once they experience it, it’s impossible to keep them off the tables. We see many families with lots of children that come in with their parents. The kids are always the ones that want to go first and if there is more than one there is often some arguing over who gets to go first.